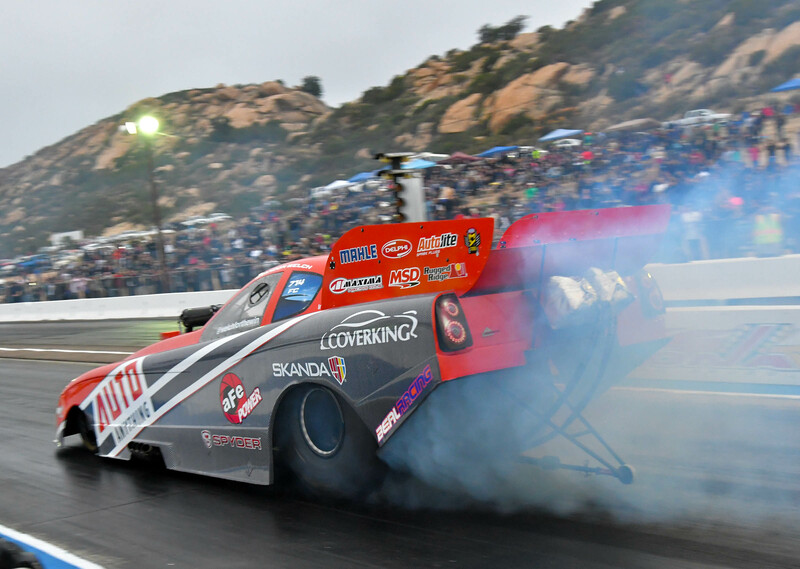 On May 28 at Barona Drag Strip in San Diego County, the Beal Racing AutoAnything Nitro Funny Car Team enjoyed an opportunity to showcase San Diego’s fastest race car on-track to hometown fans for the first time in decades. The exhibition event dubbed the Barona Nitro Battle, was arranged by 2015 NHRA Mello Yello Series funny car champion, Del Worsham, and additionally featured funny cars driven by NHRA veterans Paul Lee and Gary Densham. Turnout at the event exceeded all expectations, with thousands of fans making the pilgrimage to the track in a rural part of San Diego county between Lakeside and Ramona. Spectator areas along the track were standing room only, and crowds of fans gathered to watch the teams work on the race cars and meet the drivers. Our motivation at Beal Racing was to put on a great show for the hometown fans while also testing a new tune up. The car was completely overhauled to prepare for our 2016 competition debut in Norwalk, OH June 23-26, so this event would provide a valuable testing opportunity. A nitro funny car tune up is the product of many educated guesses on how to set ignition, fuel, and clutch settings given variables such as air temperature, humidity, barometric pressure, and track conditions. Each pass down the race track provides more data and more clarity to the crew chief for future runs. The Barona Drag Strip, with 1/8th mile of race track and 1/4 mile of shutdown area, is far too short for a modern nitro funny car like ours to make a full pass down the drag strip. There is simply not enough real estate to slow down from those speeds in the space provided. The issue is compounded by the fact that if the car fails to slow down in time, all that stands between me and a rocky ravine is a sand trap and catch net. Because of the short track, the goal was to run 150-200 feet under power for our first run and 330 feet under power for our second run. So many components of the race car changed since the last race of the 2015 season that the car’s performance at Barona was a complete unknown. Chuck Beal put together a conservative tune up for our first pass of the evening. The goal was to get the car to leave the starting line under full power without overpowering the race track and losing traction. As we waited for our opportunity to run, the temperature continued to drop. When the temperature falls the air becomes more dense and the race car makes more horsepower. We feared that the tune up would be a little too aggressive given the changing air temperature, but Chuck decided to go for it. The stage was set as I pulled to the starting line against the champ, Del Worsham. At the flash of amber bulbs, the christmas tree signaled the launch. I smashed my right foot down on the accelerator pedal and the car violently leaped forward as 6 ft. flames erupted from the exhaust on either side of me. One second later I had traveled over 60 feet of race track and still had traction. In the next half second I felt a slight vibration in the tires that continued to grow bigger. That vibration signaled to me that the rear tires were beginning to lose their grip on the race track. At about 150 feet down track the tires finally lost their grip completely and I stepped off the accelerator pedal. We brought the car back to the pit area and tore down the engine. Not a single component was damaged. It was a successful first launch. Incremental times showed solid baseline performance for the beginning of the run. We determined that the car lost traction because of a minor error in the ignition setup that caused the car to make too much horsepower right at that moment. The data proved to be incredibly useful, as we learned we can be more aggressive earlier in the run, and have to adjust ignition settings at about 1.5 seconds. Each pass provides more data and a better opportunity for consistent high performance. We worked hard for the next hour to completely disassemble and rebuild the engine. Just as we finished up it started to drizzle. Rain completely shuts down a drag race. The night ended before we could make our second run. While we were disappointed that the weather ended our evening early, feedback from the fans and racers was all extremely positive. We hope to make this event an annual tradition! The first races of the season always provide a steep learning curve as we narrow in on a consistent tune up, so this event provided an opportunity to get a step closer to that goal. To see more pictures and media from the event, check out our Beal Racing Facebook page.